Can Berniecrats Reclaim the Democratic Party? Activists at this year’s diverse and optimistic People’s Summit think so. Likewise, despite the mainstream media’s reflexive insistence on portraying Sandersistas as spoilers, the talk this year was about how the movement can take over the party. “We are so close,” said Nomiki Konst, a journalist appointed by Sanders to the party’s Unity Reform Commission. Not everyone was so sanguine—and of course the corporate wing of the party is fighting back—but the people I talked to here want to reclaim the party and return it to its populist and New Deal roots, not destroy it. Like Konst, Wong is concentrating her efforts on change. Indeed, while the Illinois Green Party had a booth—just around the corner from the Workmen’s Circle, which was giving away buttons using Bernie and Trump to illustrate the difference between a mensch and a putz—and the usual Trots hawked newspapers on the sidewalk outside the cavernous McCormick Place convention center, inside the hall the talk was about building progressive grassroots organizations, identifying and training leaders, and running for office. Christine Pellegrino, the Long Island progressive who, with backing from the Working Families Party, flipped a longtime-Republican New York State Assembly district, was just the most recent in a wave of Berniecrats in attendance, including California Congressman Ro Khanna; Black Lives Matter activist and South Fulton, Georgia, Councilman khalid kamau; Larry Krasner, who just won the Democratic nomination for Philadelphia district attorney; and Chokwe Antar Lumumba, who had just become the mayor-elect of Jackson, Mississippi. Meeting as we were only days after Jeremy Corbyn’s stunning success in Britain, the previously impossible suddenly seemed merely difficult. Because no one in Chicago pretended it was going to be easy. The corporate grip on the Democratic Party is not going to be broken without a fight. And while there was even more talk this year than last about the need to build a “Tea Party of the left,” there was also much more widespread recognition of the difficulties of doing so—and why, despite the seductive example of the alt-right in capturing the Republican Party, progressives can’t simply cut and paste that strategy into our own struggle. “The conditions for a Tea Party of the left are very different from the actual Tea Party,” said Waleed Shahid, co-founder of the millennial group #AllofUs. 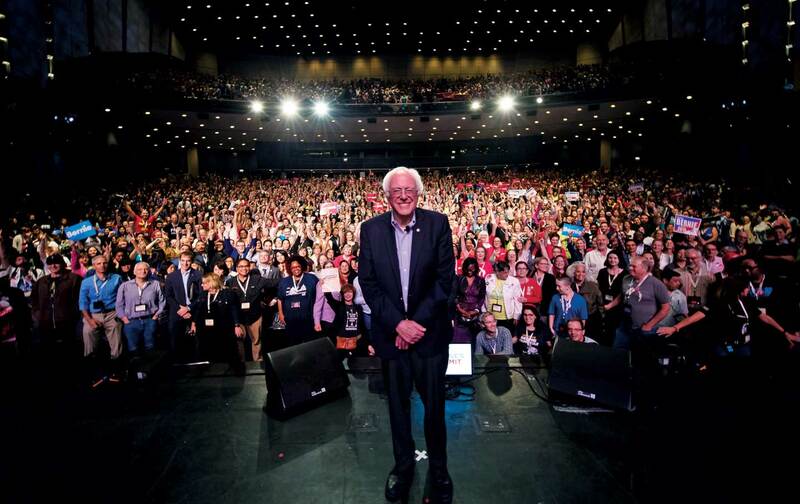 Progressives “still haven’t found a way to tell the story of who we are—or that all of these candidates are part of the same movement,” he added. Sanders himself gave the summit’s keynote speech—a vintage stemwinder that included all the usual applause lines (“$27!”), plus a surprisingly sensitive section anatomizing Trump’s betrayal of the working class on trade, health care, and taxes. The huuuge lines before his speech underlined the senator’s unique star power as the most—perhaps the only—widely loved elected official in the country, and the perils posed by the fact that, so far, Sanders’s social capital does not seem readily transferable. At least not in Montana or Omaha. For the moment, though, it felt enough just to be visible to one another—in our strength, our diversity, our optimism, and our growing numbers. As Corbyn’s remarkable story should remind us, our power comes not from ideological certainty, financial leverage, or social privilege, but from the simple, inescapable fact that we are the many, and they are the few.